Just over a week ago, Ace Attorney: Dual Destinies, the first main series Ace Attorney game in over five years, was released in Japan. And while real time has passed, not much has changed in the world of Ace Attorney. It is still filled with excellent mysteries, crazy characters, and over-the-top courtroom drama. If the old Ace Attorney games had one annoyance when it came to the characters, it was that you kept running into the same ones game after game. Of course with the lawyers, prosecutors, and police, this makes sense; and it was rather enjoyable to see their development. But the recycled witnesses were more than a little redundant as time went on. How many times do we have to see Oldbag hit on Edgeworth before it stops being funny, for example. But like in Apollo Justice, all the people directly involved in the cases of Dual Destinies are new to the series and are a real joy to get to know. The cases themselves are all new and take place in varied locations as well. These range from a bombing in a courtroom, to a murder in a professional wrestler-filled Japanese village, to a stabbing at a space center. In addition, all of the mysteries are very original and do not retread any of the cases found in past games. 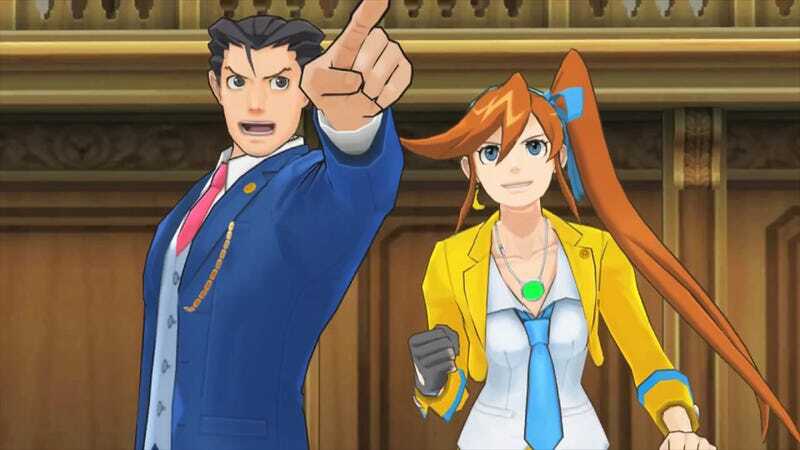 As both Phoenix and Apollo are playable characters in Dual Destinies, both of their special powers—the ability to see Psyche-Locks and Perceive visual tells—are available in the game. The addition of Athena to the cast adds her ability, the Mood Matrix, to the mix as well. The Mood Matrix is the best new feature of the game as it allows you to see witnesses’ emotional states and then point out the inconsistencies between what they are saying and how they are feeling. Also, compared to the other games in the series, Dual Destinies has many more multiple choice questions over the course of each case, making it much harder to simply guess your way to a solution. These culminate in a final several-question multiple-choice logic train that takes you step by step through what you know so you really feel like you're solving it. As a longtime fan of the series, I always hated the evidence gathering sections and longed to be back in the courtroom. While searching for evidence, the games often became little more than a pixel hunt across the game's various locations—trying to find that one background item that was actually a vital clue needed to continue the plot. In Dual Destinies, this process has become much more streamlined. Now, you visit most locations just to interview witnesses and only a few of locales—i.e., the actual crime scenes—actually require you to hunt for evidence. The crime scenes are now 3D rooms which you can rotate and investigate from a variety of angles. Moreover, rather than pixel hunting, a red circle appears around your pointer whenever you hover over a piece of potential evidence. Then, after you have searched said area, the red circle is replaced with a check mark. These additions make this whole section of gameplay much more enjoyable. Since it was announced, Dual Destinies has been heralded as the return of Phoenix Wright as the main character. This is only partially true. You don't play as Phoenix for over half of the game. In the game's sixteen parts, you play as Phoenix for seven parts, Apollo for five, and Athena for four. But more than that, Dual Destinies is not Phoenix's story; it's Athena's. Nearly every plot point in every case revolves around her—and even the few that don't, revolve around Apollo. For the most part, Phoenix is almost a non-character in the story. He develops very little and is simply a player proxy who comes to the rescue when Apollo or Athena needs him. That said, Athena's story is a good one, with many layers of twists and turns that the series is known for. Just don't expect it to all be about Phoenix. And as the game is not centered around Phoenix, many of your burning questions remain unanswered—namely anything to do with Maya, Kay Faraday, Franziska Von Karma, Detective Gumshoe, and any number of other characters. Trucy and Pearl appear but do little more than play the assistant for a short section or two—and even Edgeworth's role is kept to a minimum. One of the odd little features in Dual Destinies is a quiz mini-game. In it, you play as Apollo who is locked in a room with Trucy by a mysterious criminal and must solve five crime-related brain teasers—much like those you'd find in the Professor Layton games—to get out. Currently, the mini-game only has one stage but three more will be released here in Japan as paid DLC in the coming weeks. All in all, Ace Attorney: Dual Destinies is an acceptable Ace Attorney game. While it never reaches the emotional stakes of the first or third games in the series, it has a decent story and a lot of good new characters. On the gameplay side, the abilities that are included make the courtroom even more enjoyable; and tweaks to the investigation gameplay make it far more fluid and thus more fun. If you are a long-time fan of the series, there is no reason you shouldn't pick this one up as well. And if you are a newcomer to the series, Dual Destinies is a great starting point as its focus on new characters means that knowledge of previous Ace Attorney titles isn’t required to enjoy the game. Ace Attorney: Dual Destinies was released in Japan on July 25, 2013, for the Nintendo 3DS. It is scheduled for a Western release sometime this fall.